The blessing and the curse of the Ace Combat series of games is that you generally know what you’re getting every time. The Notorious M.A.S. is a big fan of Ace Combat, as evidenced by the fact he practically begged me to mail him Ace Combat 4: Shattered Skies – as a reminder, Mohamed was living in Saudi Arabia at the time – and just did demo impressions for Ace Combat wannabe H.A.W.X. 2. M.A.S. is the type of person that hears of a new Ace Combat game and girds his loins for the routine of the series. If they were to mess with the series too much, he would likely throw an apocalyptic fit that make my best rants look sound like something from Stephen Hawking. I am with The Notorious M.A.S. 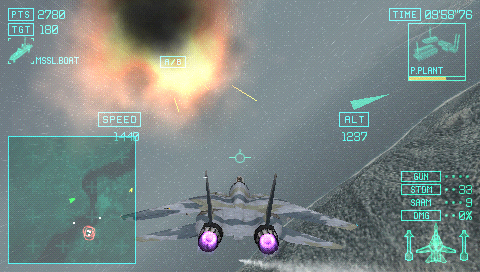 in that I’m happy with Ace Combat in the classical sense (ie: don’t screw it up by thinking too much), though I’m different in that I generally enjoy the gameplay in small bursts. Give me a half hour of blowing things up, and I’m golden, but anymore than that and I’m getting pretty bored. I did really like Ace Combat 6 for the 360, because we finally had a system that could handle the ambitious nature of the franchise. But when I received word that Ace Combat: Joint Assault was coming my way, I asked whether or not the PSP was cut out to handle the game. I went out and bought Ace Combat X: Skies of Deception to see how the PSP handled it before. I came away from that brief experience underwhelmed. I wasn’t any more impressed with Joint Assault, unfortunately. Anyone familiar with previous AC games knows that the storylines can border on the obscene, as they prefer to be dramatic instead of realistic. It’s no different this time around. You play the part of a rookie pilot with Martinez Security, a private military contractor (read: mercenaries) that starts out doing an air show. You are part – really, the entirety of – the Antares Squadron, while four other pilots are part of the Rigel Squadron. Right off the bat, listening to your mates in the Rigel Squadron, you can see the big neon sign come up in your head screaming “THESE MEN WILL BETRAY YOU”. Before you know it, you’re being sent out to defend against an attack on Tokyo being put out by an Eastern European terrorist group named the Valahia who’s goal is to start their own country. Furthermore, it quickly becomes apparent that both sides are being financed by a businessman named Andre Olivari, who’s pulling strings so that he can sell insurance that “protects” against war-based or terror-based damages. Logistical questions such as “isn’t anyone monitoring the money ties here?” and “worldwide governments can pinpoint every person on earth to within a meter in a matter of seconds, and they were too blinkered to know that a bunch of Eastern European thugs were developing super weapons and gaining a nuclear presence?” sadly go unanswered. As a matter of fact, when the major bad guy on the Valahia side talks to Oliveri while he’s on your plane and taunts him for thinking he could be controlled by money, it’s brushed off by your supervisor saying “was he serious? Could there be a link?”. You really think so, Doctor? I guess Martinez Security doesn’t have the authority to detain a megalomaniac before the U.N. can take him in, nor can the head of a PMC figure out something I was able to figure out in the third stage. Needless to say, the story is nothing you haven’t seen before; it’s like Tom Clancy and Alex Jones got together and decided to write a video game. In terms of modes, you’re going to see the same things you saw in Skies of Deception. You have campaign mode, vs. mode, and the ability to look at your past records. The big change is the ability for others to connect to you and join into your campaign for some co-op action, supporting up to four players working in concert. This is a great addition, and would be even better if not completely neutered by the PSP’s limitations; this is the kind of thing we would want to see on the 360 or PS3, where their respective infrastructures support that style of gameplay better. As it is, you need friends who own the game. There is support for versus play via the Playstation Network, and the modes are standard to what we see in other, similar games, including standard dogfight modes, capture the flag and others we’ve seen time and time again. The addition of online play is nice, but finding games – even days after release – was a chore – there’s usually only one game going on in the entire world at a time – and the balance is completely out of whack. You can only use planes you’ve unlocked in the single player campaign, which means that anyone who’s spent the time to grind themselves up to get an F-22 is going to have an unfair advantage. I first went in when I was only a few campaign modes in, and didn’t stand a chance as my plane simply was not capable enough to fight against four other people with too much time on their hands to get through the single player campaign. You can build up credits through the campaign mode, though to afford any plane of consequence, you have to replay the same missions over and over again. There are branching story paths, but you have to start a new game to see all of them; you can’t just go back and replay a mission or story branch to see the other branch. This is a silly omission, and if I recall correctly, it was one that was in Skies of Deception as well. It could be said that having to replay single player missions over and over again adds replayability, but this is a false dichotomy; repeating the same thing isn’t replayability, it’s grinding, and buying good airplanes requires a grind similar to what you would find in an old-school JRPG like Final Fantasy. 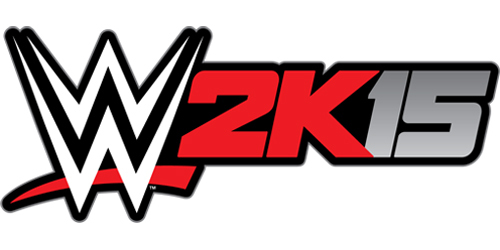 Unfortunately, it’s necessary to be competitive online, so if you buy this game with the intention of getting the most out of it, prepare for a repetitive time drain. The missions themselves are often broken up into two parts with their own goals. Oftentimes, these boil down to little more than blowing up things that are marked in red as targets, while blowing up anyone else just for the credits, or because they have things that can hurt you (like SAMs). What gets on my nerves is that there are virtually no checkpoints in the missions themselves; if you die fifteen minutes into a mission, you start the mission over unless you’ve hit the second phase of the mission (and if you have, you lose the credits you earned in the first half). This turned a two or three hour game into my entire week, as most missions have a 20 minute time limit and use most of that just blowing up different enemies, some of whom show up after you’ve blown up targets. “Oh no! More enemies have shown up on the radar!”, says my assistant, who somehow missed the fact that you can’t really hide a bunch of AA guns effectively in open air, and oh look at that, they have SAMs that just blew me up. I have to start over again. Isn’t THAT a %$@!ing kick in the nadgers. It’s artificial structure to a stage that really shouldn’t have that kind of structure. What’s worse is that an awful lot of time is going to be spent fighting super weapons, like large planes that require multiple stages of blowing up guns, heat vents and what not. There are too many of these stages for them to be special anymore. Instead of going “woah, that’s a big freakin’ plane”, I ended up going “oh joy, another big freakin’ plane” by about stage 10, all of whom have multiple stages of taking them out before they’re beaten, and if you happen to make a mistake, you have to start the whole thing over. What’s ironic is that most of your time is spent taking out superweapons and ground targets, but the thing that made Ace Combat so good in the first place – air-to-air dogfights – is strangely de-emphasized in JA. There is one mission that I didn’t like at first, but I grew to like: you have to fly Oliveri through a ravine in a Boeing 747 while enemies are trying to kill you, and without being able to accelerate above 1,000m lest a bunch of SAMs take you out. It’s definitely something unique, and despite bitching about it at first, I grew to enjoy the mission. Everything about Joint Strike will feel familiar to Skies of Deception fans, as it uses the same engine. In terms of actually getting out there and flying, JA defaults to a third person camera behind the plane, as well as a turning mechanic that makes the plane feel more like a car than a plane. 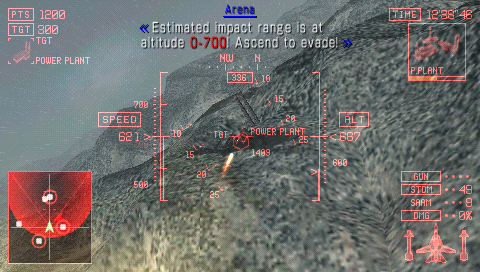 Anyone who has played any Ace Combat game – or really, any air combat sim – is going to want to switch to the “advanced” controls ASAP, as the default controls are horribly limiting. Even then, they changed the up and down directional pads to two commands that I can barely remember using, whereas before, they would yaw up and down. When your 2010 game controls worse than your 2006 game, you have issues, though it’s going to feel natural to fans of the game, especially people who have played Skies of Deception, though I don’t think the ability to hot-swap between the third person, cockpit and HUD cameras (hold L+R, press select) was in the last game. 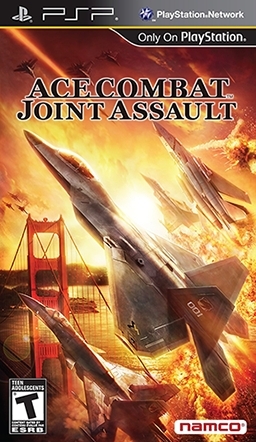 With all that said, Joint Assault is not really a difficult game. Yes, you will have issues, and you will die often, but it’s not so much because of challenge as it is just cheap gameplay. The only truly challenging areas I can find in the game is where the aforementioned turncoats fight you. It’s in these stages – four on one dogfights – where you finally see what makes Ace Combat awesome when Namco simply lets it breathe. Then you go through three more stages of hitting ground targets and having to get above/below a certain elevation with an eight second notice, and you wonder why they even bothered. 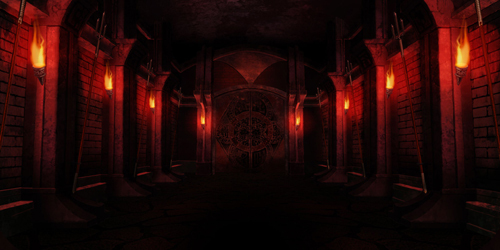 The boss fights in particular – which, as I’ve stated, are plentiful – are especially annoying due to their multiple stages and lack of sense, especially the later ones, which are positively absurd. 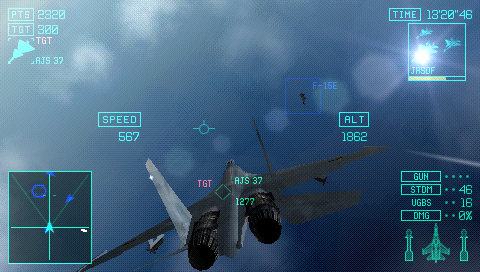 This could have been such an awesome dogfight game if Namco would have let it. 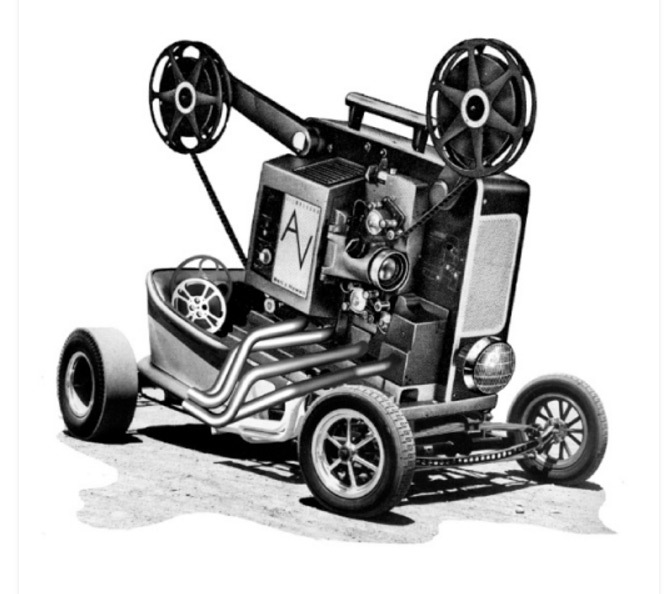 There are reasons to go back to stages other than credits, though they’re largely superficial. You’re ranked on your performance, though I’m confused as to how that works, exactly. There are stages I thought I nailed and only got a C in, and other stages I thought I didn’t do too well in that I S-ranked. 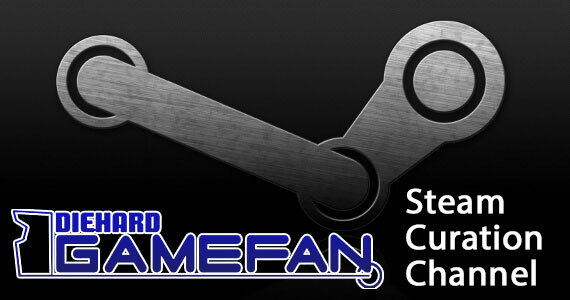 It seems largely random, but since credits are given based on rank, it’s something I’d love to figure out, honestly. You are also given medals for jobs well done, such as shooting down X amount of planes with your gun, but they’re ultimately frivolous; this would be a great game for those reported PSP trophies, but as it stands, you can proclaim yourself the marksman champion of your living room. The only true replayability comes from having to do the same missions over multiple times, and as I’ve stated, that’s false replayability that only truly dedicated players are going to go back to. In keeping with the “this is a 2006 engine in 2010” theme, the game doesn’t look very impressive. It’s certainly functional – it’s not like you can’t tell planes apart – but this is a four year old engine, and it shows. 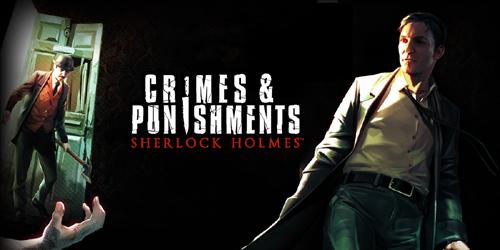 They made a big deal out of this game having “real” locations such as San Francisco, London and Tokyo, but in reality, you’re not going to notice what cities you’re flying over for the most part. You might look up and go “oh, look, that’s Big Ben”, but except for a couple of standout locations, you’re not going to notice the difference between one city or another, which is more the fault of the PSP’s hardware than anything. What gets me is that despite having four years, there’s still no improvement in how the game loads. Loading times are still extremely long, and to make things worse, the game has an install feature that does almost nothing to alleviate said loading times. Installing the game is a waste of 375MB, which is more than my fiancée’s entire memory stick. Audibly, JA is a mixed bag. On the one hand, the voice acting is truly atrocious, from the main characters to the stereotypical “assistants” you’re allowed to choose from. There are four nationalities you can choose from, but they all speak English with their brand of accents. The British guy in particular is laugh-out-loud awful, sounding like he came straight from a Monty Python tribute group. Thankfully, this is made up for by a good soundtrack that runs the gamut between slower tunes and some straight-up, fully vocalized J-Rock that really gets you into the fight, especially when you fight against your old Rigel Squadron mates. 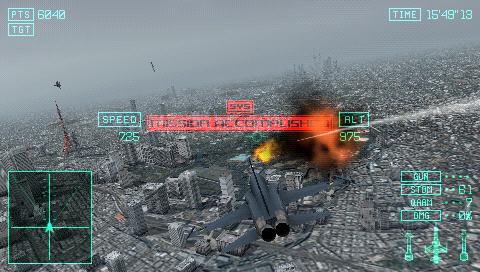 Ace Combat: Joint Assault is not a bad game. It is, however, a completely uninspired one. Though the addition of online multiplayer is a nice one, every other part of this game was done four years ago, and in some ways, it was done better. That’s inexcusable. Big-time fans of Ace Combat will eventually want to pick this up, but absolutely, positively not until the price is slashed in half. $20 is just above what I paid for Skies of Deception, and even Ace Combat fanboys like The Notorious M.A.S. shouldn’t go a cent above that for this game. Everyone else should either wait for Assault Horizon or check out the recently released H.A.W.X. 2 if they want some arcade-style dogfighting, because Joint Assault falls short.